Came over on ship, "Marmaduke" in 1611. Came to Virginia in 1620. Granted about 400 acres of land 4 mi. from Jamestown, Virginia, right on the James River. He was responsible for saving Jamestown's inhabitants from massacre in 1622. His indian servant Chico warned him of impending attacks and he warned the settlers. Department. Pace descendants over many years have sought to visit Paces Paines, now the estate of Mr. Franz von Schilling and known as Mount Pleasant Plantation. The Von Schillings have welcomed us warmly, and have twice entertained our annual meeting groups." 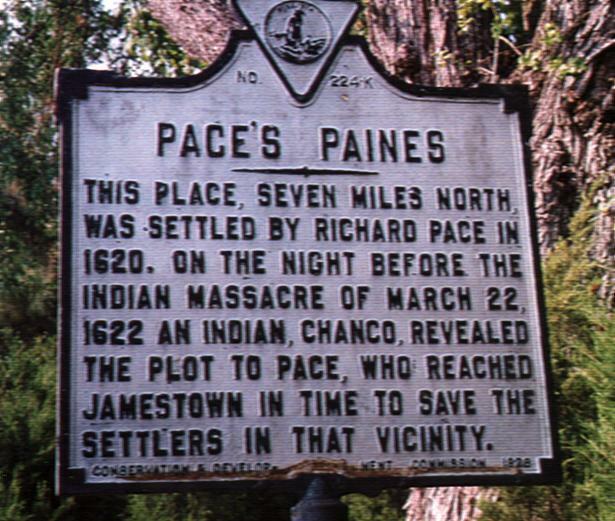 "But now 'Paces Paines' needs our help. I strongly urge that every member write a letter, or letters, as suggested by our Dr. Ben McCary, whose open letter to members of the Pace Society follows. Marvin H. Pace, President." Let me know if you're interested in more photos from Jamestown,Virginia regarding the Pace family. I have edited out all persons who are still living by placing a "LIVING" before their last names. If you are interested in more information, please contact me directly.